Here's the recipe for bowtie pasta with Gorgonzola I mentioned in the mushroom mania post. If you love mushrooms like I do and Gorgonzola cheese, then you'll like this. Get your tissues ready... it may make you cry. It is so delicious! It is very simple to make, a great choice for a fast evening meal. Takes mere minutes to prepare. Try experimenting with a mix of wild and button mushrooms. I love the flavor of fresh sage as well. About an hour before beginning to cook, place dried mushrooms in warm water to soak. After an hour, drain mushrooms, squeezing out excess liquid. Reserve soaking liquid and give the porcini a rough chop. Put a deep pot of water on high right now for the pasta. Place butter and oil in a large flat pan. Heat on medium, add onion and chopped porcini. Soften for a minute or two, then add garlic, fresh mushrooms, sage, a tiny bit of salt and lots of black pepper. Let them brown a little. Pour in wine and soaking liquid, scraping any browned bits off the bottom of the pan. Reduce heat and let it simmer a minute or two. The pasta water should be ready. This is a good time to cook it. Don't forget a generous amount of salt for the pasta water. While the pasta cooks, add the Mascarpone and Gorgonzola. Drain pasta reserving about a half cup of the starchy water. 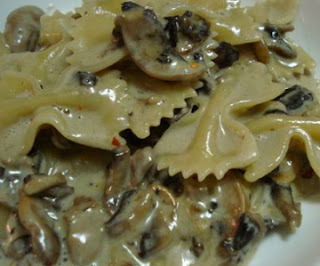 Toss hot farfalle immediately into the Mushroom-Gorgonzola sauce. Stir to blend. After tasting, add more seasoning, if needed and toss in a few more sage leaves. If the sauce becomes to tight (dry,) add a little pasta cooking water to loosen it up. Serve right away with a little Parmesan to pass around. While sauteing the onion and garlic, throw in the cubed chicken breast I mentioned above. Make sure it is nearly done before proceeding. Continue with recipe as directed. 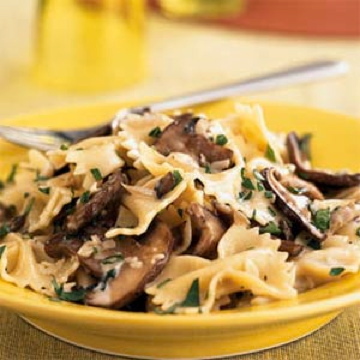 Gee... all of a sudden I have a craving for Farfalle with Mushrooms. Guess what we're having for dinner?